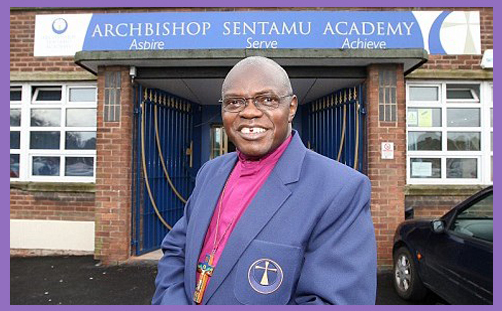 If Sentamu opposes Free Schools, why is he opening and blessing them? The Archbishop Sentamu Academy in Hull is bucking national trends for schools in deprived areas, and the Ofsted data provides empirical evidence. Five consecutive years of improving GCSE grades, and A-level results which enabled every one of their sixth-form students to go to their university of choice. Very impressive. What a pity, therefore, that Archbishop Sentamu himself lends his name to the NUT-Labour trend for propagating disinformation on the Coalition’s flagship education policy. In a further Telegraph piece by John Bingham (who seems to be grabbing an awful lot of coffees at Bishopthorpe these days), the Archbishop of York says Free Schools are a “confusion of policy” which benefit only the wealthy middle class (he says those “with means and ability”). They do this, he says, by diverting millions of pounds away from efforts to raise standards in established schools (Bingham says “in the state sector”, but Free Schools are tax-payer funded and so part of that sector). Dr Sentamu’s criticisms echo the opposition rhetoric of the Hon. Tristram Hunt, who dismissed Free Schools as an “ideological experiment”; a “vanity project for yummy mummies”. This isn’t, of course, the first time the Archbishop of York has aligned himself closely with Labour Party policy. Only last week he cloaked Marxist economics in “the theology of where I am coming from“, and clearly favours the old socialist remedies to address deep-seated social problems. With education, he advocates the very statist solutions which doomed generations of children to illiteracy, innumeracy and a life on the dole. It is not insignificant that Labour shifted its traditional support for local authority control over schools: the chronic failure of many – especially in Labour-controlled inner cities – was manifest and profoundly unjust. Something had to be done. Kenneth Baker started in 1988, establishing Grant Maintained Schools, financed directly from Whitehall. The Blair/Adonis/Blunkett reforms of 2000 established the Academy programme, paving the way for Gove’s 2010 expansion of that policy and the development of Free Schools – all beyond local-authority jurisdiction and oversight. These schools create more choice for parents, the educational objective of which is to drive up standards. The Archbishop of York’s principal objections to Free Schools are threefold: i) that they are “often operating in direct competition with new state-of-the-art academies”; ii) that they constitute a “failed attempt” to create grammar schools; and iii) that they cater mainly for the children of the middle class and better off. Competition, of course, provides choice, and that market dimension has been seen to be a powerful impetus for school improvement. No longer are children obliged to attend the local “bog standard” comprehensive: if an established school isn’t bringing home the bacon, new schools are opening that offer creative curricula and different pedagogical approaches to instil academic hope and provide better career prospects for children of all abilities. That is the rationale for injecting a bit of competition into the system, because – let’s be honest – not all “state-of-the-art academies” are performing as well as they ought. But the Archbishop’s assertion that Free Schools are (re-)creating grammars is very odd, because they are prohibited by statute from selecting their intake by academic ability: admissions are wholly in line with Labour’s Academy programme, which Michael Gove approved and expanded. In fact, any selective private school which converts must adopt the statutory non-selective admissions policy, thereby actively decreasing the number of selective schools. Free Schools are a world away from the academic ethos of the grammar system. And as for Free Schools benefiting mainly the wealthy middle-class, while the assertion is confronted by the reality these schools aren’t selective and 72% of them are situated in areas of economic and social deprivation, the ‘wealthy/middle-class’ argument has been levelled time and again at what are often called ‘Faith Schools’ (ie schools with a religious foundation, including Church of England schools), which the Archbishop not only supports but vehemently defends against all critics. How can he question the legitimacy of Free Schools on the basis of alleged middle-class privilege while affirming the ethos of Voluntary Controlled and Voluntary Aided schools, which are perceived to benefit that same socio-economic stratum of society? But the Archbishop is intractable on the immorality of the policy: “I cannot see why in East Hull, for example, when you have now got a fantastic secondary as an academy, achieving now about the national average, you would want to create another free school there,” he sermonises. Which is curious, not to say bewildering, in light of the fact that the Archbishop Sentamu Academy has itself just established a Free School in that area. It is called the ‘Aspire Academy‘, and aims to educate 150 young people who are considered vulnerable and at-risk. It is the brainchild of the Archbishop Sentamu Academy principal, Andrew Chubb (does the Archbishop ever speak to him?) who says “..there is an urgent need for the Academy, with permanent exclusions rising and the current system for dealing with these children coming to an end”. This new Academy is, in fact, a Free School: a Free School is simply an Academy without a predecessor state school. Many Free Schools have been set up by highly successful Academy chains such as ARK. Does the Archbishop of York not understand this? Is Mr Chubb aware that his Patron opposes his own Academy’s strategy for dealing with often ‘unteachable’ children who are most at risk of permanent exclusion? Does he know that his Patron believes the policy to be “confused”? Is he able to rationalise how a Free School aimed at the vulnerable and often lowest-attaining children constitutes an attempt to create a grammar school in Hull? Why is Archbishop Sentamu singing the praises of his own Academy’s new Free School while trashing the rest as the product of “confused policy”? Is that a classic Church of England fudge? Why is he condemning Free Schools in the Telegraph but blessing and praying for the one he just opened? Isn’t that a via media too far? Why is this Free School exhorted to “transform” young lives and succeed in it mission, but the others are dismissed as a “failed attempt” to create grammar schools? Is it because this new Free School is called the ‘Aspire Academy’, and so the Archbishop didn’t actually realise that it is, in fact, a Free School? Is it that his opposition to the policy is actually purely ideological, but when it comes to the empirical reality he is “delighted” that the freedoms embraced by a free school might indeed “support those most in need in its learning community”? As for the effectiveness of Free Schools, it may be observed that they are disproportionately located in areas where they are most needed – ie, where there is a shortage of places. More than a third of those most recently approved will be situated in the most deprived communities in England, and those already running are delivering outstanding results. Schools like the Reach Academy in Feltham, which has been rated outstanding by Ofsted, or the London Academy of Excellence in Newham, one of the most deprived areas in the country, which got six of its pupils into Oxbridge this year. It’s no surprise that Free Schools are attracting almost three applications for every place. They are performing better than local authority schools, and are twice is likely to be rated outstanding by Ofsted. Coming so soon after the launch of the Archbishop of York’s book On Rock or Sand?, it is increasingly difficult to sustain the Archbishop of Canterbury’s assertion that the Church if England is “political; not party political”. Dr Sentamu is actively promoting the Labour Party and its policies. By attacking a specific Conservative policy – indeed, the first Bill introduced by the Coalition and a programme to which the Liberal Democrats committed themselves in their 2010 manifesto – the Archbishop of York has well and truly entered the General Election fray as a ‘non-party campaigner‘. One wonders if the costs of his manifesto book and a portion of his lobbying expenses episcopal salary might not count toward Labour’s General Election campaign spending?